[The University of Newcastle Art Gallery, 17 July - 23 August, 1998] In an exhibition of constructed and painted objects Graham Lang and Ross Woodrow reflect upon the colonial experience in South Africa and Australia . The contrasting approaches to production in the floor and wall works are unified by use of the vocabulary of British nineteenth-century imperial power which was common to both Africa and Australia. For to the British, the instruments of civilization were interwoven with the symbols of imperial power. The once potent symbols of the crown, the British bureaucratic system, the railway, not to mention the classical art of the Royal Academy are today mostly embarrassing reminders that bestowing the gifts of civilization was a masquerade for often brutal conquest. 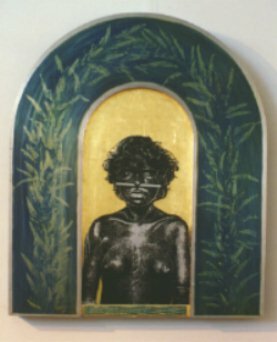 IN 2001, a version of this exhibition was taken to the Broken Hill City Art Gallery under the title: IMPLEMENTS OF PERSUASION: the shared history of British conquest in Africa and Australia. 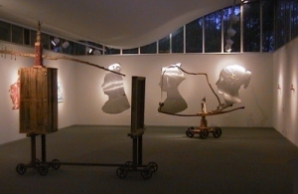 Works by Graham Lang and Ross Woodrow. Opening: Broken Hill City Art Gallery Thursday 10th May, 7.00 p.m. The back corridor of the gallery featured works by Ross Woodrow that had been originally presented in his 1996 exhibition Bush Burial.